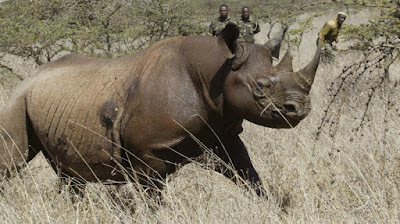 Ten black rhinos have died after being moved to Tsavo East National Park, the Kenyan government announced. The only survivor was injured after being attacked by a lion. Eleven of the endangered animals had been moved in an attempt to start a new rhino population. However, it was soon revealed that the water in the park was too salty, causing the rhinos to become severely dehydrated. The government had originally planned to move fourteen rhinos to the new habitat, but transportation of the final three was canceled after the initial deaths. Speaking at a press conference, Tourism Minister Najib Balal blamed the deaths on negligence and poor communication among government officials. With fewer than 5,500 black rhinos in the world, the animals are critically endangered. Kenya is home to 750 of the remaining rhinos. The black rhino deaths come shortly after the devastating loss of the last male northern white rhino in the world, which died in March.